When going from phase 2 to phase 3 it can sometimes be hard to get out of the trend of eating only twice a day. In phase 3 it is very important to keep the fire we have started in our body constantly burning. Think of a fireplace, you don’t throw all the wood in it at once! Yes it will burn hot for a while but eventually it goes out. You want to feed the fire a little at a time and keep it burning for as long as you can per day. Here are some tips for the eating transformation from phase 2 to phase 3. Keep in mind this is only an example and some items may not follow the original protocol list. Once you have the hang of this diet, my experience has been that most people tend to incorporate little tricks or food items they have found to have no negative effects along the way. Here are some tips for getting through phase 3. 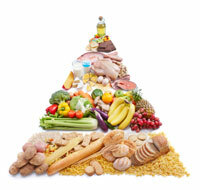 Learn the nutrition triangle (When in this phase it is important to keep a good balance of nutrition. Until you get the hang of it look at the triangle everyday and try to choose one type of item per day from each part of the triangle. Guilty Pleasure (it’s important to treat yourself to at least one guilty pleasure a day whether it be a couple of cookies or a couple pieces of chocolate, just remember to try and keep it under 100 calories so you don’t overdo it . But reward yourself after a long day!